I'm looking to get back into music and the idea and sound of an acoustic bass guitar appeal greatly to me. But I have no idea where to start. I'm in Wellington, don't mind driving to sit down with someone to talk it through or getting on the phone if it's easier than writing. It fits my ideal, any thoughts on the practicalities? Hello Steven. Welcome to the site. That bass looks similar to the one in the you tube, but the youtube bass is a 4 string. The bass being a fretless will be a bit harder to learn on since to get the note in the right pitch you have to play exactly where the fret would be. On a fretted you have a centimetre or two to put your finger and the intonation will be good. Hi Stephen. Welcome to the site. Acoustic basses aren't very load unless you play them through an amp. It can be a bit hard to hear yourself against one loud acoustic guitarist if you are playing unplugged. And if you play it through an amp and the amp is really loud, they tend to feedback. But if you like the tone (and I do ), they are great. John has already said a fretless is a little harder to learn. The best advice is to try some out if you can. The Wellington Rockshop should have one or two to try. You're unlikely to find a fretless one in a shop, but you'll get the idea. I'm attracted to 5-strings because it gives me a deeper register. In your experience is it used? Both John and I just have 4-strings, but a lot of people here play 5's. I've been pretty tempted to get a 5 from time to time. Occasionally I play with keys and we'll transpose from E to Eb to make it easier on them and I end up jumping up to Eb on the A string. That's the situation that most makes me think I should get a 5-string, but I could also solve that problem with drop-D tuning. I can't really give an opinion, but I think the main thing to watch for in a five string is that the B string has reasonable tension and isn't too floppy. Some five strings can also have a narrower string spacing than 4 strings which some people don't like. In the end it all comes down to preference, and what you are used to. It is still worth going down to a shop and playing a few 4 and 5 string basses (even if the aren't acoustic) to see what feels right to you. Beagle has a Cort SJB-3 Acoustic, with flatwounds on it. Awesome guitar, and even with the flats it sits in with my acoustic. deecee wrote: Beagle has a Cort SJB-3 Acoustic, with flatwounds on it. Awesome guitar, and even with the flats it sits in with my acoustic. Yep the Cort ac bass I have sounds really good and is great value for money. I'm not sure if they do a 5 string version. As joppo said... they are quiet unless plugged into an amp and feedback is pretty nasty if you have to play loud. Unfortunately the intonation isn't very good which means that any notes from the 12th fret upwards are out of tune so check that out before you buy. Obviously a fretless version wouldn't suffer from this. 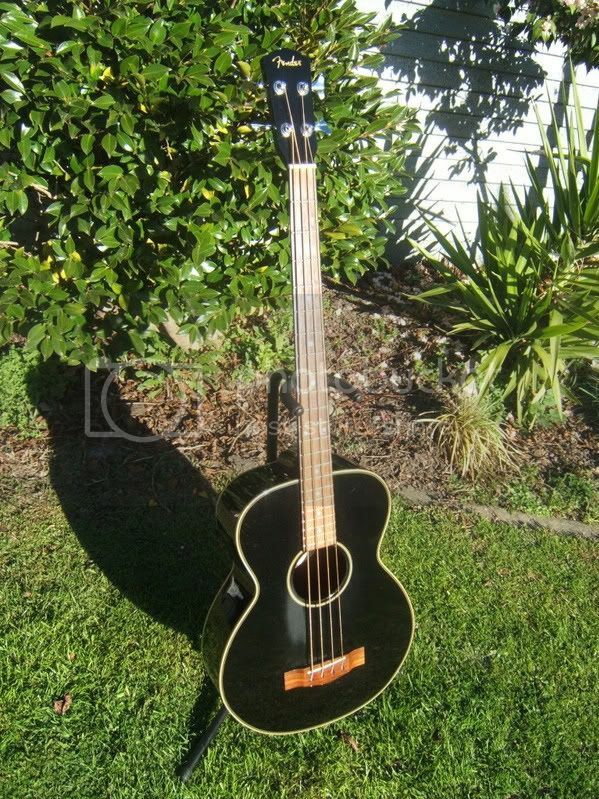 Hi Stephen ,I have no other experience with any acoustic basses aside from the one I own,had it for many years and out of the 6 bass guitars i own (all 4 stringers) it is the most played by far. I've worked out scales and arpeggios by myself, guess it's time to find a teacher. Nice one Stephen. What did you end up buying in the end? Got a photo? Agreed.. the ability to just pull it out anywhere is really good. I just a did a few gigs on my acoustic over the last month and really enjoyed it. Also I found the flatwounds has a much more organic 'upright' sound to it. [quote="beagle"]Nice one Stephen. the ability to just pull it out anywhere is really good. beagle wrote: Nice one Stephen. the ability to just pull it out anywhere is really good. I've not yet restrung it for two reasons: I wouldn't know where to start and, for the moment, I like the fact the standard strings are so unforgiving - makes me concentrate on what I'm doing. Any suggestions for teachers down this way? Should I be looking for someone who teaches both bass guitar and double bass? For technique and sound?